Some say Millennials are the fast food generation. But the fact is that the quick service restaurant industry sometimes struggles to keep up with what the younger set really wants from the food industry in terms of nourishment, employment, engagement, and more. Here are a few of the ways Gen Y is impacting the traditional fast food model. There’s no question that this generation is all about mobilizing the fast food experience. DMI Research found that 63 percent of millennials have at least one quick-service app on their phones. More than one-third of millennial customers use mobile routinely when they visit a quick service restaurant industry restaurant. With the emphasis on user experience, it’s probably no surprise that Domino’s (which has arguably one of the best mobile apps in the industry) is enjoying phenomenal market performance. Freshii founder and CEO Matthew Corrin set out to deliver on the promise of affordable food choices that appeal to the palate of a health-conscious generation. Thousands are people lining up to purchase franchises (without Corrin soliciting franchisees). There’s no doubt that there’s a strong market demand for this kind of culturally conscious, generationally evolved option. For established restaurant chains, using crowdsourcing to get millennials involved in developing the next iteration of menu options might pay off very well. One thing is for certain, you can’t afford to ignore their changing tastes. In another twist on mobilizing the quick service restaurant industry, millennials want their food to come to them. They expect their hamburgers, tacos, and smoothies delivered to their doorstep. Plus, they want it all without a significant increase in cost compared to what they would pay in-store. Businesses that want to compete for those delivery dollars must find a way to revamp their model. However, this is easier said than done for quick-service chains that are used to the drive through, pick up to go, and dine-in models that keep all employees on site. One solution to this quandary is to find the right outsourcing partner. Businesses that specialize in food delivery can help you scale easily. They can handle liability insurance for company drivers, training, scheduling, and all the other administrative details that are outside your restaurant’s area of expertise. Sites like GrubHub and DoorDash even handle the technology side of things. They make it possible for customers to place orders through the delivery website. That’s a plus if your own tech is a little behind the curve. However, it does mean customers see other options from competing restaurants. Making it possible for customers to order for delivery from your own app may help keep them loyal and drive up recurring revenue. Matthew at Gourmet Marketing wrote the following about Gen Y workers in an industry with a shockingly high rate of turnover. “Young job seekers want clear advancement opportunities, lenient work conditions, and special treatment. The quick service restaurant industry typically requires that staff members work rigid shifts, weekends and even split shifts if needed. Millennials tend to be more demanding of their dignity and personal accommodations than other generations. Therefore, we see even higher churn rates.” Young fast food employees want a culture they enjoy. They love causes they believe in, and want a clear path for advancement. Day to day, they desire flexibility, respect for their personal time, and lots of positive feedback. If that sounds like a recipe for disaster, consider this. Millennials are an important customer demographic in the quick service restaurant industry. Also, they are very, very into social media. What Does that Mean for Your Quick Service Restaurant Industry Brand? Making a good impression starts at the table (or the drive-through) for your job applicants. 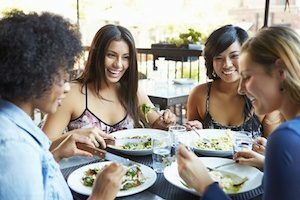 Millennial customers who love the atmosphere at your restaurant are more likely to want to work there. They can pick up on a place that’s fostering enjoyment for everyone. However, if your job applicants and employees dislike your company’s managerial style, everyone is going to know about it. Hundreds of millennials may apply for open positions at your restaurant. Therefore, it makes sense to ensure that they have a good experience during the application process—even if they don’t get the job. Using an automated platform for the quick-service restaurant industry that’s mobile-enabled is a must for reducing frustration. Following that up with an easy onboarding experience adds to the positive impression. For more information about software that makes it simple to recruit, hire, and onboard millennials, contact our team at Efficient Hire.